Surrounded by ancient trees, People’s Park of Urumqi was originally a lake on the west bank of the Urumqi River. When the Urumqi City was built in 1755, it was turned into an official place for rest. Nowadays, you can admire the elder’s dancing with the natural beauty in the park. In spring, tulip exhibition in the park is a highlight. People’s Park of Urumqi is dotted with a variety of trees and flowers. In addition, some old buildings make the park more attractive. 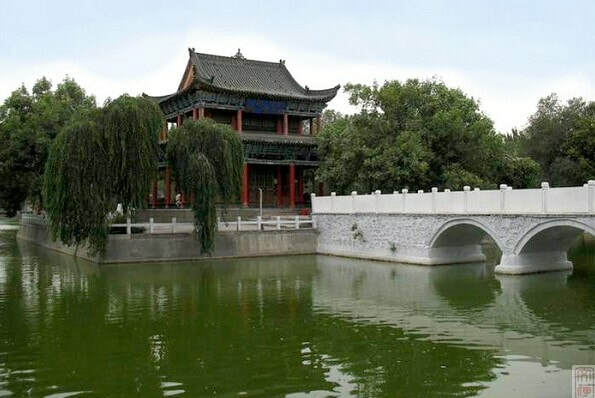 You will see Longwang Temple, Zuixia Pavilion, Xiaochun Pavilion, Chaoyang Pavilon built in 1926, Jianhu Pavilion, and the Yuewei Cottage built to commemorate Ji Xiaolan – a great scholar in the Qing Dynasty (1644 - 1912). Built in 1899, Jianhu Pavilion is the best-preserved building in the park. Surrounded by waters in the west, east and north, the pavilion features lifelike paintings of animals and flowers. From April to October, flowers exhibitions, bonsai exhibitions, painting and calligraphy exhibitions, photographic exhibitions are regularly held in the park. Children will enjoy themselves at the children’s playground. If you are luckily, you could see the local elder practicing singing, dancing or playing the local instruments in the park. Between December and March, you will find ice sculptures in the park. Skating competitions are always held in winter. Jianhu Lake freezing in winter, locals love to skate on the lake. If you are planning to visit for photography purposes, the best time to visit is during the sunset. The best months to visit are from May to September. Several buses pass by the mountain. Therefore, there are several options. Rent a vehicle to the mountain. This is the quickest and most direct option. Take Bus 7, 17, 35, 58, 61, 62, 63, 68, 73, 157, 508, 528a,528, 902, 907, 910 and Bus 927 to the Stop of Xiaoximen (小西门). Then walk westwards. As at 27th December 2018, it is free to visit the park. If you are planning to visit the park in winter, please wear enough warm clothes and take care of your valuables. Please wear the sunscreen cream, sunglasses and the like as it is dry around the year in Urumqi. Interested in visiting the Urumqi Peoples Park on a Tour? Wendy Wei Tours offers a variety of different packaged tours as well as custom tours including the Urumqi Peoples Park, among other attractions and destinations. To find out more, please visit our Tours page or Contact Us directly to find out more.